Captain of the University of California-San Diego swim team in both her junior and senior years, Michelle Steinberger is a four-year (1985-89) NCAA Division II All-America in both the 100 and 200-Meter Butterfly events. She is co-holder of UCSD records in the 200 and 400-Meter Medleys, 50-Yard Freestyle, and 200-Meter Freestyle Relays. Representing Los Angeles at the JCC Maccabi Youth Games in Detroit in 1983, 16-year old Michelle captured 10 medals-- seven gold, two silver and one bronze. Two year later, she coached L.A.’s swimmers at the Maccabi Youth Games in Toronto, Canada. 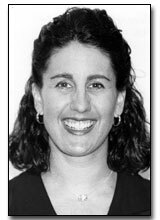 Swimming for the United States at the 1988 Maccabi Pan American Games in Caracas, Venezuela, Michelle collected a combination of six gold-silver-bronze medals. She also won numerous awards at Chatsworth High School, as well as age group swimming honors.